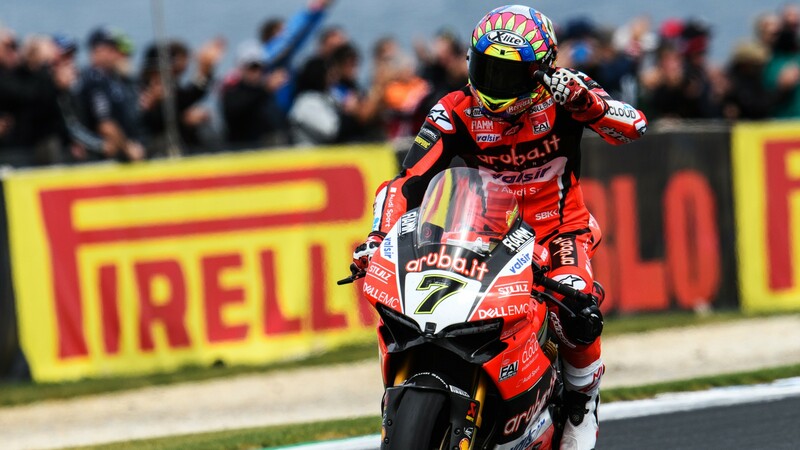 Straight off the heels of two convincing performances at the Motul Thai Round, Chaz Davies (Aruba.it Racing - Ducati) heads into the start of the European season with increasing momentum. After a mixed weekend in Phillip Island, the Welshman dominated Race Two at Thailand whilst also securing a promising third place in Saturday’s race. Davies is one podium away from tying Italian legend Max Biaggi for ninth-most top-three finishes (71). A staggering collection that began six years ago, right at the venue of Round 3 of the 2018 championship: MotorLand Aragon. “Aragon 2012 was an awesome race”, he remembers. “I think it was Melandri, Biaggi, and maybe Tom [Sykes] or Eugene [Laverty] in the front group. I chased them down from quite a way back, and it was the first time I thought “Hey, I can do something in WorldSBK!”. Davies started at the back of row two, but crept up the field into a four-way battle for the top, edging Champion Biaggi off the front three by 0.03 seconds. MotorLand Aragon has remained a special track for Davies in the WorldSBK calendar. That first podium was followed by his first double win and first best lap in 2013. But his fondest memory came two years later: “The highlight for me [at MotorLand Aragon] was my first Panigale win in 2015. We had a tough season in 2014. In 2015 we improved the bike a lot, and it was really special – I wanted to be the guy to get the first win [for Ducati] and Aragon was the place I did it on that bike”. Currently at six MotorLand Aragon WorldSBK wins – a circuit record– Davies’ record paints a promising picture for the Welshman’s weekend. Confident? Definitely. “I feel good going into Aragon. I feel like I’ve been putting in the work. Just feel good on the bike at the moment, which is the important thing. I said it at Phillip Island, we’ve got a good balance at the minute”. “Obviously a lot of people look at me because we do have such a strong record at Aragon, but personally I take it like any other race”, he reasons. “The race was very close last year, I feel like there’s other guys I’m looking at. I feel like, take it just like another race, and go from there”. None of Davies’ wins at MotorLand Aragon came from a pole start – his only Superpole here leading to drama last year, as the Ducati rider went to the floor when leading ahead of Jonathan Rea. A little less pressure going into Saturday: “I’ve had 28 wins, and I think only 3 or 4 poles. Pole doesn’t really mean much to me. I would love more, but it’s not a strong point. In the back of my mind I know that races can be won from the third row or fourth row of the grid, so yeah, I’m not too worried about that”. Watch the Welshman battle for a record seventh win at MotorLand Aragon, all with the WorldSBK VideoPass.